2:10 I am done for the day - I got what I came for . Thanks for coming. See you next week. Take a course. 6/8/2007 12:50:25 PM Mountain Al:: DAM: the 11:37 trade time was not selected by my software, which knows statistically which times work best. Just a sophisticated version of TG's observations, refined with programming. 6/8/2007 12:40:33 PM Mountain TG:: whoops, hit submit button twice. I'm not sure how Al chooses his trade times but using his chaos courses, I don't think I'd be revealing too much to say that if a nice trend develops that last's most of the day it is going to usually start between 9:30 and 10:30 sometimes as late as 11:00 but usually not that late. Once it gets going there is usually a mid day consolidation with potentially good moves typically not coming again until 12:30-2:30. It doesn't always play out this way of course but I think it does more often than not. 6/8/2007 12:21:58 PM Mountain TG:: I work at it every day. Thanks for the compliment but when I become profitable enough to really do some good for others than I'll deserve compliments. Done for the day, too. 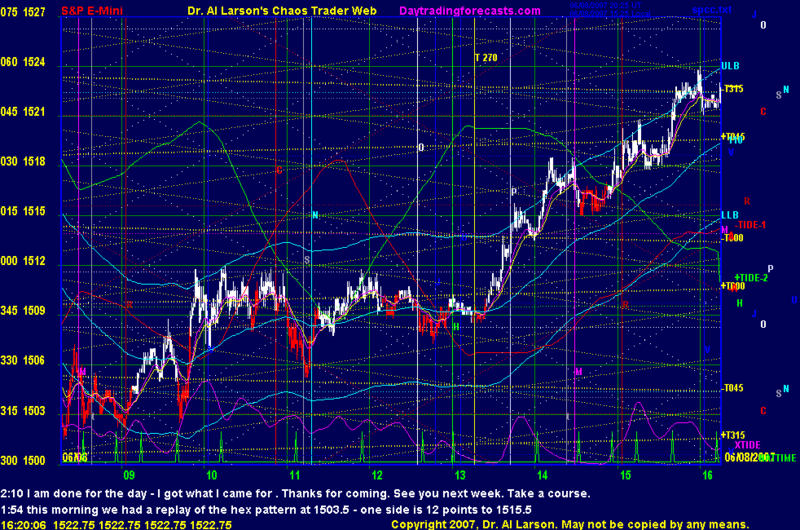 With that last up move, price went up near top of my FOP so unlikely another good risk reward setup will take place. 6/8/2007 11:59:23 AM Mountain Al:: TG: as I've told you before, it's your hard work and application that has paid off. Every teacher loves a student who actually works at something. You are one of my Chaos Trading Heros. 6/8/2007 11:56:02 AM Mountain TG:: Very nice. CTME and FOP courses paid off for me well today. Long from 9.75 out at 14.75. + 5 is plenty sweet though there could be more coming, I grab the 5 unless the move is ultra powerful. I took the 20/110 cross at 13:06 (seemed to be a little juice there) as confirmation that CC move 4 was over. Had to sweat out a recross against me but those 3 minute bars from 13:09-13:21 didn't have the sort of juice to make me think my initial thinking was wrong. Thanks Al, your course work has again paid off for me. 6/8/2007 8:26:42 AM Mountain rnt:: Al, is there anyway you can get Xtide2 in line with the Sept future. Its a bit of both at the moment. 6/8/2007 7:56:21 AM Mountain jrg:: is there anybody in here?